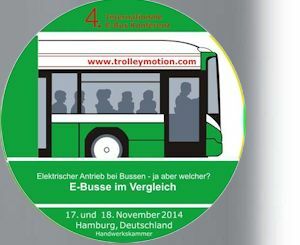 Battery and trolleybuses are the only available pure electric buses available. Trolleybuses are a long established, reliable and highly efficient mode of transport. Battery buses have a long history of not being able to provide a like for like service. The reasons don't appear to be obvious and superficial planning for clean, emission saving operation has seen a long heritage of good public relations excercises that do not deliver their promises. In this article we discuss why they won't be able to within future decades. Not only is the weight and capacity of possible designs unable to deliver sufficient performance during a service day but current battery technology requires replacement every few years, making battery buses uneconomic and potentially extremely expensive. Battery electric buses where the energy to propel the vehicle is obtained from electric storage batteries on board the vehicle.The batteries are charged from an external source, usually the Grid, typically overnight. Most modern battery buses use chemical batteries based on Lithium technologies e.g. Lithium Ion. There is some use of so called super-capacitors which are considered to be batteries for the purposes of these notes. Hybrids exist - many modern trolleybuses carry batteries and/or super capacitors to allow operation away from the overhead wires for several miles - or to store energy recovered during electric braking. For the purposes of these notes, so called diesel electric hybrid vehicles which are diesel vehicles with electric regenerative transmissions (which can recover energy during braking), are not considered to be electric vehicles. Electric vehicles are considered to be those propelled by an external power source (such as the Grid), not an on-board power source such as a diesel engine. Diesel electric hybrids share most of the characteristics of other forms of diesel vehicles. They offer some advantages over conventional diesel vehicles such as modest reductions in fuel consumption in some circumstances, but not enough to justify their purchase price in the eyes of most or all of British commercial bus operators. In the UK the purchase of most or all diesel electric hybrids, is subsidised by tax payers. This classification may become less clear in future as diesel electric hybrids will probably emerge which also charge their batteries from the Grid. To further confuse the issue, diesel buses with all mechanical (flywheel) regenerative transmissions may appear. Fuel cell buses in which electricity is generated on board by 'fuel cells' which combine oxygen from the atmosphere with hydrogen (usually) stored in very high pressure tanks on the vehicle, have been around for about fifteen years. A new fleet trial is just about to start in Aberdeen. The cost of ten buses and re-fuelling facilities is reported to be £19 million [BUSES Magazine May 2014]. Fuel cell buses have already being trialled in London. About a decade ago there was much hype about fuel cell vehicles and predictions that by now fuel cell vehicles would be in volume production. However the situation in 2014 is that most or all of the few fuel cell vehicles which are running are doing so on an experimental basis. From industry magazines like Automotive Engineer it is clear that so far as the world's major motor manufacturers are concerned, fuel cell vehicle development is on the back burner. The main research and development effort is now on improving internal combustion engines, developing battery electric vehicles and various forms of hybrid. Clearly there is no possibility that the fuel cell bus will prove to be a serious alternative to the diesel or trolleybus in any predictable time frame. As the primary energy conversion process takes place off the vehicle a variety of primary energy sources may be used including, thermal (gas, oil, coal, biomass, etc. ), nuclear fission, wind, wave, water, solar, etc., in any mix and the mix may change over time and might one day perhaps include nuclear fusion (the process that powers the sun) or energy sources not yet even dreamed of. Off vehicle primary sources are generally cleaner and more efficient energy converters than on board sources, such as diesel engines. For example a modern 'combined cycle' gas fired power station has a conversion efficiency (gas into electricity) of around 60% whereas a diesel bus engine (diesel fuel into mechanical energy) does no better than about 40% at best and in practice less when part load running, idling, transmission losses, etc., are taken into account. The overall efficiency of thermal power stations can be raised if the waste heat from such power stations can be used for example for district heating, as in Moscow where the power stations supply the city's extensive electric public transport systems (metro, trolleybuses and trams) and heat the city. The exhaust from a modern gas fired combined cycle power station is inherently very clean, unlike a diesel which is inherently dirty and which requires increasingly costly and complex emission control equipment to attempt to achieve conformity with ever tighter emission control requirements such as Euro 4, Euro 5 and Euro 6. In many modern towns and cities, there is a very significant air pollution problem, substantially caused by the use of internal combustion vehicles, particularly diesels. Boris Johnson, Mayor of London, has recognised in an article in the Daily Telegraph of 7th April 2014 that to quote his words, 'The trouble is that the standards adopted (called Euro 4 and Euro 5 etc.) have not worked. That is to say, motor manufacturers have been able to diddle the [European] Commission: the cars and trucks have appeared to conform on the test tracks; but when it comes to everyday use, on real streets, it is a different story. Or in other words, attempts to improve by regulation, the cleanliness of diesel exhausts, does not work in practice. With off board primary energy conversion, an electric vehicle emits no emissions into the streets at all, unlike a diesel bus engine. Furthermore this zero emission capability of the electric vehicle is maintained whatever the age or quality of maintenance of the vehicle, whether idling or cold running, etc. It is sometimes said that electric vehicles merely transfer pollution to the power station. This is very misleading; when and if power station pollution reaches street level it is highly diluted and modern power stations have much cleaner exhausts than internal combustion (IC) vehicles anyway. As percentages these are 42% for a trolleybus and 37% for a battery bus [power station gas supply to electric vehicle wheels]. Note that these efficiency comparisons do not allow for the fact that battery buses tend to be heavier than trolley (or diesel) buses and tend to need more energy to propel them. For comparison (fuel filler to wheels) the efficiency of a diesel bus is around 25% when part load running, idling, transmission losses, power to run cooling systems, etc., are taken into account. These factors do not affect significantly the efficiency of electric vehicles, of course. More strictly, any efficiency comparison between electric and IC vehicles should start at the refinery and take account of energy losses involved in transporting fuel, etc. As the primary power conversion process is located off the vehicle, primary power sources which have low or zero or neutral CO2 emission characteristics can be used which in general are impractical on a vehicle. Such power sources include wind, wave, water and nuclear power and burning biomass. Detractors of electric vehicles sometimes trot out power generation data typically of 1950s coal burning power stations, such as 70% losses in the form of heat to the environment (30% efficiency) to discredit electric vehicle CO2 credentials. Modern coal burning power stations actually achieve efficiencies of around 40% (60% heat to environment if no use can be found for it). The best modern thermal power stations (gas and steam turbine combined cycle stations) achieve efficiencies of 60% (40% heat to the environment if no use can be found for it). It should be further noted that these stations burn natural gas which because of its high hydrogen and low carbon content compared with coal, inherently emit less CO2 than coal burning stations anyway or vehicles which burn diesel fuel. In Britain coal burning in power stations is being phased out, so any discussion of the CO2 credentials of electric vehicles based on coal burning data, especially out of date data, is becoming irrelevant. At the time of compilation of these notes, there appears to be a certain amount of hopeful enthusiasm for the idea that battery electric buses are now capable of replacing diesel or trolleybuses in most or even all circumstances. We shall attempt to show that this enthusiasm is misplaced by studying a couple of state-of-the art battery bus applications. In the case of both examples we shall show that for a mixture of practical reasons, battery buses are simply not an economic alternative to diesels. Overseas experience of the operation of modern trolleybuses shows that on busy routes or networks the operation of modern trolleybuses is a practicable and economic alternative to diesel and much more environmentally friendly than diesel. Essentially economies in the operation of electric vehicles pay for the power supply infrastructure. 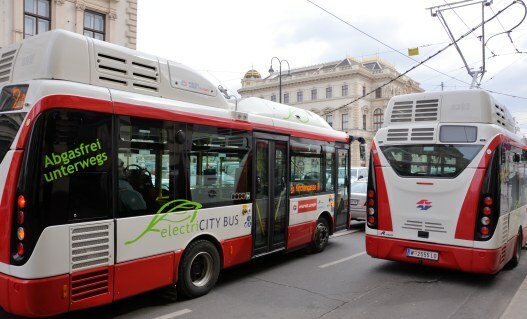 Consequently, on busy routes or networks, battery buses are not an economic alternative to trolleybuses. The practical reasons why battery buses are not an economic alternative to diesel or trolleybuses are to do with range (on a single charge) and the weight of batteries which can significantly reduce passenger capacity (needing more vehicles and more drivers) and increases energy consumption. Obviously of course, range can be increased by carrying more batteries but that reduces passenger capacity (needing even more vehicles and drivers) and further increases energy consumption. In service re-charging might appear to get round these problems, but brings its own difficulties in its train (please see below). It is understood that the operation of this service by electric buses is temporarily suspended (please see http://www.dorsetecho.co.uk/news/localnews/dorchester/10711350.Poundbury_s_electric_buses_temporarily_taken_off_road/ , so we shall discuss the service as it was during the summer of 2012. The service operates from the railway station in Dorchester to the Prince Charles owned Dorchester suburb of Poundbury. The service runs from morning to early evening requiring two drivers. One diesel bus could serve the route all day, but the range limitations of a single battery bus means that two battery buses are required, one for the morning shift and one for the afternoon/evening shift. The timetable is a tight one with no opportunities for in-service stationary re-charging. Re-charging is done overnight. Whichever way it is looked at, battery electric operation of the Poundbury route is a great deal more expensive than diesel as two expensive electric buses are required to do what one much cheaper diesel can do. The route is too infrequent (once every 30 minutes) to be economically operated by a single trolleybus. 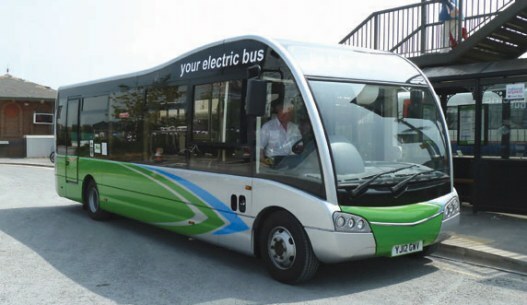 Most battery buses tried to date in Britain could be described as midi or mini buses. The limitations of battery buses, particularly the weight problems, are less severe on smaller vehicles. Also smaller vehicles may be used on easier duties than full sized vehicles e.g. duties with generous layovers. It is full sized vehicles that represent the real challenge to battery bus designers. 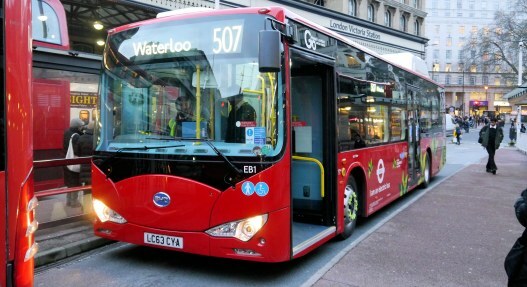 Some full sized single deck (a full sized battery double decker has yet to appear) battery buses supplied by BYD are being trialled in central London. Compared with diesel or trolleybuses of similar design, the BYD buses are approximately 40% heavier, and carry about one third less passengers. Range is stated to be about 155 miles - enough perhaps for one shift but not the two shifts that most diesel or trolleybuses have to do. So on a busy route or network that means about 50% more battery buses with 50% more drivers will be required at any one time to carry the passengers that diesel or trolleybuses can carry and the battery bus fleet will weigh about double that of an equivalent diesel or trolleybus fleet meaning double the energy consumption. Extend the comparison to two shifts and in fact you will need around three times as many battery buses as you need diesel or trolleybuses, a depot three times the size, etc., as at any one time half the total battery bus fleet would be out of service re-charging or waiting to re-charge overnight, like the Poundbury electric buses. Clearly in the case of the Poundbury route and the BYD buses, current battery buses are a long way yet from successfully competing practically and economically with diesel or trolleybuses. The future of battery electric buses is, of course, critically dependent on the development of batteries. If one considers the BYD buses, ideally these should be able to perform two shifts on one overnight charge with a battery weighing no more than say half a tonne, the weight of about seven or eight passengers. The present batteries weigh about three tonnes, so that would mean to compete with diesel or trolleybuses a twelve fold improvement in battery capacity would be required with little or no increase in cost and indeed preferably, a cost reduction. To put that in perspective, the capacity of electric bus batteries has about doubled in the last decade, so a twelve fold improvement in capacity could take around 35 years! In service re-charging of battery buses is an attractive idea as it would appear to allow battery buses to carry smaller batteries and thus more passengers and permit greater ranges. Re-charging is normally done with the vehicle stationary. 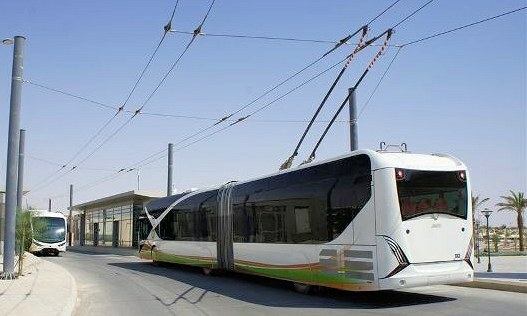 Compared with diesel or trolley vehicles, static re-charging usually means modifying timetables to create the time to re-charge vehicles, thus needing more battery vehicles and more drivers plus (significant) investment in the charging facilities at the re-charging points typically at route termini. In service re-charging is normally 'fast recharging'. A fast recharge might be re-charging at a rate that in say 30 minutes could put in a similar amount of energy to that which might be put in during an overnight (eight hours) slow recharge. Fast recharging tends to shorten the life of (expensive) batteries, compared with slow overnight charging. Proponents of battery buses often suggest that battery buses can be re-charged during layovers, overlooking the facts of how short layovers tend to be and that layovers provide a buffer against late running and are not always taken or taken in full. In this writer's experience as a bus driver, timetabled layovers might be two minutes after a 45 minute run, eight minutes after a one hour run and 20 minutes after a 2 hour run [this layover actually came down to five minutes after de-regulation in 1986]. Continuous re-charging re-charging on the move - would appear to have the potential to completely overcome the limitations of battery buses. As simply plugging a cable into a moving vehicle like a bus is not practicable (although it is for say a lawnmower), that only leaves twin overhead conductors (wires) or inductive charging. Inductive on the move re-charging requires the primary side of the transformer which is buried under the road surface to be replicated every few metres at very great cost and the installation process is very disruptive to road users. The vehicle being recharged has to drive directly above the primaries and cannot, for example, drive in an adjacent lane without losing the re-charging ability. 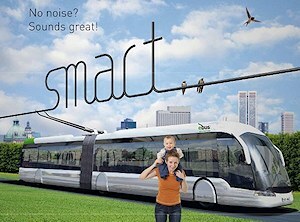 Re-charging from twin overhead wires is much cheaper and much less disruptive to install than inductive charging and more efficient. With suitable current collection equipment the vehicle can easily move either side of the wires. In fact with continuous recharging from twin overhead wires, battery size can be reduced to nothing or to a small size (say half a tonne) for occasional excursions away from the overhead wires to avoid road works or traffic or other problems. Of course a battery bus continuously re-charged on the move from twin overhead wires would, essentially, be a trolleybus.